Sunday was a bit of an odd day. As a huge number of citizens in Burma were starting their celebrations from a likely NLD victory, Amnesty UK had a number of our activists protesting outside the Burmese Embassy in London. Why? Weren’t the elections free and fair? Well, if you want a one word answer then it's a resounding no. And you might just note in the media flurry this week that the words 'free' and 'fair' have been replaced ‘freest’ and ‘the most democratic’. A small but critical play on words that are easy to miss. Aung San Suu Kyi summarised it well. When asked exactly the same question, she said the polls were not fair but ‘largely free’. She was referring to the fact that roughly 20% of the population (10 million people) were unable to participate voting during this election. Some voting irregularities have also been reported with advanced voting, fraud and intimidation. So that brings us back to our protest. It might seem a small number in comparison, but at least 110 of those unable to vote are prisoners of conscience, with at least 19 having been jailed in the last month alone Many, but not all, were detained for peacefully marching across the country in March 2015 to protest against a new education law. A law which the All Burma Federation Student Union (ABFSU) believes limits academic freedom. In a sign of how little is changing, just last week her husband Lin Htet Naing was also imprisoned for his part in organising the protests. He had spent nearly eight months in hiding. This is why our protest was so important. During the next few weeks, as the media leave the country, prisoners like Phyoe Phyoe Aung and Lin Htet Naing must not be forgotten. Despite a new NLD majority government, the military will still appoint the Home Affairs Minister. And they control the police, security services and justice system. So in all likelihood there will still be political prisoners. Right now and over the next few weeks we really need your help to keep the pressure on. 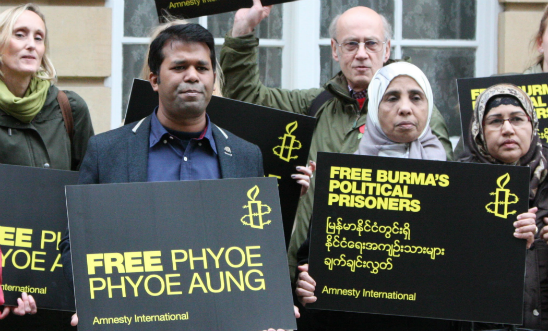 Amnesty International has chosen Phyoe Phyoe Aung as one of our Write for Rights cases this winter. In part this is because we believe showing solidarity will keep the morale up of those wrongly in prison, but it is also because this is a case we think we can win by keeping up the pressure.